This soup started from the fact that I always have carrots sitting in my crisper and despite my best intentions, sometimes they get a little sad. The good news is, slightly sad carrots make good soup. 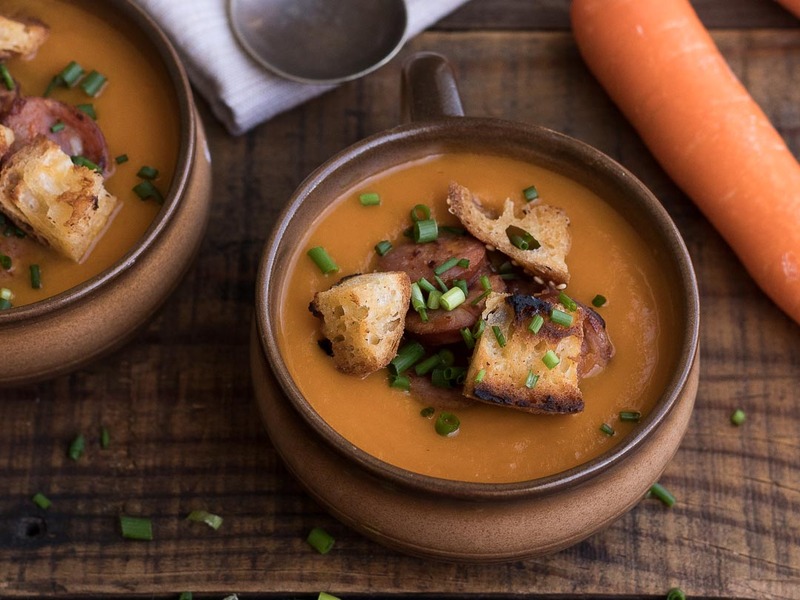 Adding chorizo and crunchy croutons turns the humble carrot soup into something special. If you don’t have beef stock, you can substitute with vegetable stock or even water. Heat olive oil in a large saucepan and saute the onion till it softens and becomes translucent. Add carrot and beef stock and bring to a gentle boil. Simmer till the carrots soften and can be easily pierced with a fork. Whilst the soup is cooking, place the chorizo slices in a cold pan and cook over medium heat. The fat from the chorizo will start to run into the pan and you’ll continue to cook the pieces till they’re browned on either side. Remove the chorizo pieces and add the cubes of bread into the pan and toast until golden brown all over. When ready, remove the pot of soup off the heat and blend with a stick blender. If the soup is too thick, you can thin it down with a little water. Add the milk and continue to blend till it’s well incorporated. Taste the soup and season with salt if needed. To serve the soup, ladle the soup into bowls and top with a few chorizo pieces, a few croutons and a scattering of chives.